Preheat oven to 350 degrees Fahrenheit with the rack set in the middle. Butter a round 9-inch springform pan and cover bottom with parchment paper. In a double boiler, melt the butter and bittersweet chocolate, stirring occasionally to blend. Keep an eye on it and turn off the heat as soon as it’s all melted. In the jar of a blender, place the eggs and sweetened condensed milk. Puree until smooth. Incorporate the melted chocolate and puree again. Then add the almond flour, baking soda, baking powder, salt, and puree again. Lastly add the boiling water and puree again. Pour the batter into the prepared cake pan and bake for 40 minutes, until top is fluffy and springy to the touch, and a toothpick comes out moist but not wet. Patti I am so excited to try this cake for Easter because I’m gluten free and so is this cake..I’m not a fan of a cake being to wet or “brownie” like..can I add more almond flour..or add less milk..to make it moist cake..not overly wet? I watch your show all the time..Mexico is beautiful. That is so awesome that you made a ramekin on the side…great idea, Christine! Pati I see a few people on here are concerned about wasting the rest of the can of condensed milk. I was just going to say I used the remainder of the opened can and made no churn ice cream to go with the cake. Just a thought. It was all very tasty. That’s a great idea, Jeff. Thank you for sharing. Wonderful cake, i put 1/2cup water, and had to bake it longer. But still good. I’m happy to hear you enjoyed the cake, Patti. Hi Pati – this looks so good that I want to make it for Easter, but does it have a strong almond flavor? I’m not a big fan of almond flavor in desserts, so I’m not sure! My dear friend served this today for lunch and it was amazing!! I’m making it for Easter. Does it freeze well? Thinking I will make 2. Thanks! So glad you enjoyed it, Melissa. You can keep it in the freezer and bring it up to room temp when ready to serve. And tell your friend hi from me! Is there anything we can substitute for the condensed milk? If you have a dairy allergy, you can use sweetened condensed coconut milk. There are a few brands on the market and many Whole Foods carry it, in the baking section of the store. I made this cake and it was so easy. It came together as it did on Pati’s show! Its good warm and day after. Thank you Pati! Wonderful cake! Made it the first time and could not find our springform pan so we put it in a deep 9 inch square pan. This was not ideal and made the cooking time longer, but the cake was still fantastic. Love the taste and consistency! I’m glad the other pan worked out and that you loved the taste and texture, Barb. Hello. I made the cake yesterday for a gathering and while it’s delicious and rich, mine took longer to bake than 40 minutes, and the center was the consistency of chocolate pudding. Followed the recipe…………..should I leave out the water, or cut down on the butter? Oh no that’s how it should be…it’s a super moist cake. And sometimes, some ovens take a bit longer or shorter than mine. I hope you enjoyed the cake, Christine! I made this today and it’s amazing! I followed the directions exactly as they were written and produced a cake that was so moist and delicious. The only change was that it took 50 minutes instead of 40 to be fully baked. I will definitely be making this again when my children come home for Christmas. I copied your presentation for a picture for my Instagram, Pati. After all, imitation is the sincerest form of flattery! So happy you enjoyed it Cheryl! Hope you all have a Merry Christmas. Can I use dark chocolate instead of bittersweet? Of course! Enjoy the cake, Gloria. Anxious to make this for my husband, after watching your show. We do not like super sweets so I can just use the 1 can of 14 oz Condensed Milk and leave out the additional 1/4 Cup? I hate to be wasteful and be left with a partial can too. What can you suggest ? Is it ok to omit the additional 1/4 C? Go for it, Rosa! I hope your husband and you enjoy it. Thank you for your prompt reply. I walked into the kitchen to find my husband had already made the cake for ME! He said he just modified the quantity of the other ingredients in order to use the one can. He said it was super easy to make and now his new favorite. It was amazing! The texture is different due to the almond flour and it is super moist, dense and delicate all at the same time. It tastes very light and super rich! We’ve been trying to figure out how to describe it because it is so different from other cakes, maybe pound cake but light and fluffy? It was not too sweet which is fantastic. We both LOVE it and highly recommend others to try this cake. We will definitely make it again, or should I say HE will make it again. I wish I could attach a photo it was so pretty, like yours! Gracias! That’s awesome that your husband made it for you, Rosa. I hope you both enjoy the recipe over and over again. 1 cup butter seems like a lot. When I make Nana Jose’s chocolate pecan cake it only calls for 1/4 cup butter – could you please confirm? The cake is wonderful, I will definitely make it in a mixing bowl next time though. The only trouble I had was getting the flour mixed in, in the blender (a Vitamix, and quite powerful). Didn’t seem to hurt the cake at all, though, it cam3 out just great! Awesome! So glad you enjoyed it, Gloria. Great cake! Superbly moist and dense and, as a bonus, it’s gluten free!! I’ve made it in a springform pan, as cupcakes, and most recently in a bundt pan!! Wish I could post a pic! I wish I could see a pic, Rich…it all sounds YUM! I am wondering if I could use a food processor instead of a blender to make this cake? Yes you can, Jan! Enjoy the cake. Hi Pati! I just want to say thank you for this recipe. I made it for my friend’s baby shower, (the dad-to-be is on a gluten-free diet). Everyone enjoyed the cake, and no one felt excluded. It was so so good. So happy to hear that, Evita! And tell your friend congrats. How can you make this dairy free? Saw it, made it, served it, ate it. Perfect. Thank you! What an easy, delicious cake. Can be eaten plain or dressed up with fruit and a cocoa chantilly cream, or a cream anglaise. C’est si bon! Merci! So awesome, Laurie! Thank you. I have a 10″ springform pan. Do I need to adjust the ingredients or could I use a different kind of baking pan? No a 10″ pan will work great too, Susan. Have fun! Oh I hope your husband had a wonderful birthday! And I’m so happy to hear this is one of your go to cakes now. No worries about the sinking…it’s the nature of the cake 🙂 I’m so glad you enjoyed it, Sophia! This cake is easy to make and so delicious. It’s my sweetheart’s favorite and most requested desert. We now call it the “boyfriend cake” ! I love that…”boyfriend cake!” Thanks for sharing Dana. Pati I watch your show all the time. Thank you for so many wonderful recipes! Thank YOU Marti for watching and trying the recipe. I am going to the store now to pick up ingredients. Patti I watch you every time you are on PBS. I enjoy you and your family, thank you for sharing. Thank you for tuning in, Paula, and enjoy the cake! I made this for desert tonight and it turned out great. Thanks for the recipe. I love, love, love this cake. I use strawberries, or raspberries at the base and whipped cream on the side. Why, oh why does it collapse? Yum! As for the collapsing…it is this cake’s nature. Good to know I didn’t do something wrong. Thank you!! This is the third time I’ve made this moist and delicious cake. Everyone loves it. Serve it with whipped cream. Perfect. No more blender (the old Waring wore out), so I make it in the old Mixmaster (just like Mom’s). I use the small bowl for the eggs and milk, then go to the large bowl to add the chocolate and flour. Works perfectly. My oven is slow so it takes an hour. It always caves in, but I thought that was to be expected! It still looks and tastes great. I got the almond flour at Trader Joe’s. I can’t wait to substitute espresso for the water as others did. And to try the flourless almond and porto cake you mentioned. I’ve also made Nana’s Flourless Chocolate Pecan, but substituted ground walnuts that I had on hand, and that was also a success and less complicated, so good when time is short. Thanks for your sweet and inspiring show, and great recipes. Katherine, I’m so happy you are loving this cake! I make this cake with coconut cream and blue agave instead of condensed milk. I top it with homemade chocolate and coconut milk pudding. I never thought it would become one of my kids favorite cake. I also add 1 tsp of instant coffee. So good. Thank you Pati. I am Colombian and my husband is Mexican, my kids areAmerican. Everybody loves it. It looked beautiful coming out of the oven, but when it cooled it collapsed to 1/3 of the height. Don’t know what I did wrong, but I’m sure it will taste good! That’s ok…and I hope you enjoy it! Made this cake twice and it is becoming a favorite, especially topped with fresh berries and confectioners sugar. And fun to make! Oh awesome…thank you so much David! What a wonderful cake! My family loves it “as-is” but when guests come over, I top it with fruit and a little whipped cream for a special dessert! Thank you, Pati! I made this as a birthday cake and everyone raved! It was so light, not too sweet and the chocolate is so comforting. I paired it with fresh whipped cream and raspberries. It was delicate and better yet, for a celiac like me it was gluten free! Thank for a wonderful recipe that will be a staple for my friends and family. Thank you for sharing your passion! I don’t have almond flour. Could I use all-purpose flour instead. If so, do I have to adjust the amount? I have made this awesome cake twice and loved it each time. It’s now my kids favorite dessert. Perhaps my experience might be helpful for your some of your visitors who look to the comments for extra info. I do not have a springform pan, nor a blender. I just used my 9.5″ pie pan and poured (and baked) the remainder in a small pyrex dish (it will cook a little faster). I used my handheld mixer instead of the blender, perhaps I’m missing something in texture. I’ll never know and it doesn’t matter since it tastes so good. The smaller batch was frozen and then pulled out the freezer, warmed up in the oven and served as a surprise dessert in the middle of the week! The second time I made this, I added cinnamon and instead of water, I added strong coffee. So good. I’m so glad you made the recipe your own…and thank you for sharing your experience with making it. Say hi to your kids for me! The cake is delicious but mine came out liquid after 40 minutes of baking. I’ve made it twice and left it in the oven an hour. Anyone else have this experience? Sometimes it just takes a little more time 🙂 But I’m so glad you liked the cake! It was delicious! Will make it again and good for a gluten free diet! I’ve made it twice already. It became our favorite dessert. Thank you!! Thanks for yet another awesome recipe. We made this tonight and it is amazing! Hi, just mixed up the almond cake. I found my blender was not large enough. Could you tell me the cup size of your blender? Mine is only a 7 cup. Mine is small too. I was able to just barely combine the liquid ingredients in it, then I switched to a bowl for the final steps. I made the almond chocolate cake and it is delicious. My husband is crazy about it. It is even better the next day. Thanks for the recipe. We love you and your show. Oh thank you so much Mary (and say hi to your husband)! I just made the almond cake and yes it is very good. I like the almond flour aspect (texture) of the cake. So happy to hear that B! DO NOT put this in a 9 inch pan. I did and it bubbled over in my oven!! I pulled it out, mixed the baked parts into the unbaked batter and put it in an 11inch pan which seemed like a better fit. Sill waiting for it to come out of the oven to see if I have a cake to take to a gathering. Sorry to hear the 9″ pan didn’t work for you… But I hope you enjoy it! I realized what I did wrong. I put the batter in a 9-inch cake pan, not a 9-inch springform pan, which is deeper. I knew a marvelous cook like you couldn’t make a big mistake in a recipe! Hug those sweet boys for me! Pati,saw your excellent show last night, and today me and my daughter made the Chocolate Leche Cake, recipe works perfect! cake amazing, I wish I can attach a picture here, so you can see, a real hit for dessert tonight after dinner! OH so happy to hear it was a hit!! Can’t wait to make this tonight. This Almond and Chocolate Leche Cake was absolutely moist, rich and delicious served with a little whipped cream on the side. This was my Christmas dessert this year along with homemade cookies. This recipe required ingredients I had never used before like sweetened condensed milk and almond flour. I was very excited to try this because my adult daughter has issues with gluten and there are very few cakes she can enjoy-this was an absolute winner. My 5 year old twin grandchildren loved it. This cake will become a staple in my repetoire. The other recipe of yours that my family loves is your Chop Chop Salad that I serve in the summer along with tortilla chips. Thank you for your delicious food. I really enjoy your show especially when you travel and feature the food of other places. Made this for Noche Buena. It came out great. Looking forward to tasting it tonIght. Key is to follow recipe exactly. Also whole foods has almond flour for those that can’t find. So glad you liked it Pat! Love this recipe! How to do suggest storing if I am making it for the next day? You can keep it in the fridge or even the freezer and bring it up to room temp when ready to serve. Hi Patti . I am making this cake tonight for Noche Buena. Thank you for the recipe. May you and your family have a blessed Merry Christmas. Thank you, you too Lauren and Janet! Did you butter the parchment paper after placing it in the pan, and did you let the cake cool completely before removing the ring or release it sooner? I don’t recall what you did on your show, and I am hoping to make it for Christmas Day. Thank you. Butter the entire pan and then cover bottom with parchment paper, no need to butter the paper. And yes, please let the cake cool completely before releasing. Sorry I am responding after Christmas but just saw your message! Oh I hope you and your family loved it! I made the cake today. it was rising fine and then at the end collapsed in the middle. it’s dry on the bottom and at the top, but wet in the middle. is this normal? Oh yes it’s super moist cake! Hi, can I substitute regular flour instead of the almond flour? I recommend you use almond flour…and if you can’t find it ​you can add slivered almonds or pecans to the blender and let them all puree​ until smooth. I’m so making this cake. Made my mouth watery. My cake cracked on top, but as it’s cooling it seems to be “forgiving.” I think once it’s cooled and I top it with sugar it will be perfect. And my kitchen smells wonderful. Oh yes…it’s a very forgiving cake! I checked my cake to see if it was done, but the toothpick came out wet. Put it back in for three minutes. Seems to be done now, but there’s a big crack across the top. I was so excited to see this cake made on television last week and will be making it later today for Thanksgiving dinner. With so many other dishes to prepare I don’t have lots of time for fussy desserts. Also, after such a big dinner, I just don’t appreciate cakes with lots of fillings and icings. With the pie we are also serving, I think this cake will be a simple, elegant choice. I really enjoy your show. The one in which you made this cake was very special to me. In my southern family food was not just about eating, it was about being together and enjoying preparing meals. Many of those family members are gone now and my own family has scattered across the country. We all have kitchen tools, pans and bowls that belonged to our mothers, aunts and grandmothers and use many of their recipes. Thanks to technology, even when we aren’t together, we still share the dishes we prepare online. Thank you and Happy Thanksgiving. This looked so delicious I had to try it, but for some reason it like bubbled over in the oven and got everywhere. I used a springform pan and followed the directions. However I did use sour cream as an egg substitute. Not sure what to make of it. Otherwise it tastes great. Absolutely! When you are ready to eat it, just bring to room temperature to serve. Where can I see the video for this recipe? I also saw Patti make this not too long ago. It looked so moist and chocolatey and straight-forward to make that I had to try it. Plus anything with sweetened condensed milk is tops on the list. This really was simple and delicious, the perfect combination and a real crowd pleaser. Plus, it’s gluten free if you have a dietary need. Definitely keeping this on the go-to recipe list! Oh yes sweetened condensed milk is amazing! I saw Pati’s Mexican Kitchen this past Saturday and I just had to make this cake it seem so simple to make, and it was! This is a wonderful cake! it’s going on my gluten-free list. 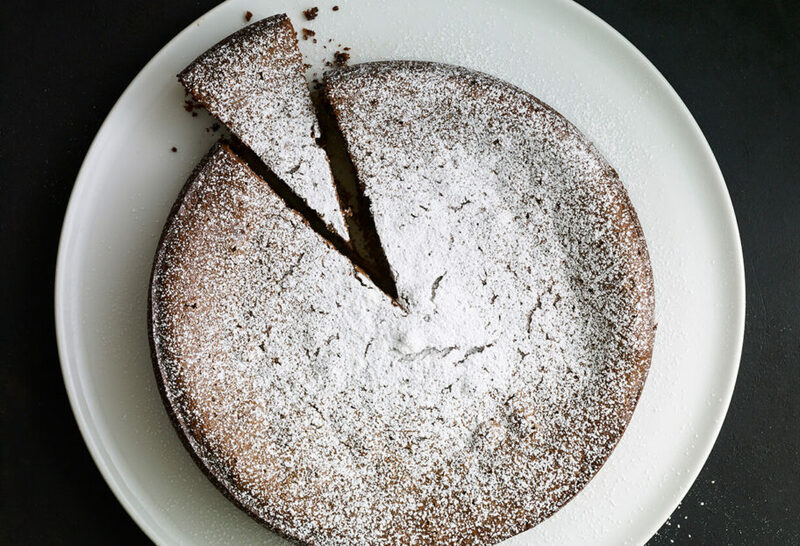 My family thinks this is the best chocolate cake ever and I have to agree with them especially because there is no wheat in this cake and it’s a very moist cake too!!!! Made this per instructions but it came up real high above the edge of the cake pan. Top cracked. Cake was light and fluffy and moist, but not almost wet. What did I do wrong? Was I supposed to use a springform pan with high sides? ​A Springform pan works best. And fluffy and moist is perfect! Looks absolutely delicious and can’t wait to make it. I wish I could have reached into the TV and had a slice. Hahaha…I wish that was possible :). I’m so glad you enjoyed it and made it your own, Ivan! I had to bake mine an extra 10 minutes as it was almost still liquid in the middle. Once it was done it fell. It looked pitiful. Major fail and a big disappointment. ​Oh I am so sorry this happened! ​Hm, then next time try leaving it in the oven a few minutes less. The texture was different than anything I have had before but I really enjoyed it. I appreciated the simple recipe. It turned out great on my first try! Cant get almond flour where i live all they have is all purpose and self rising flour. Can u use all purpose instead of almond flour? ​You know what you can do? You can add slivered almonds or pecans to the blender and let them all puree​ until smooth. Works great as well! Any way to make without scm? Started watching your shows and love when you go into the cities…we have so much cultural history to offer. Looking forward to trying your cake but wondering have you ever added sliced almonds into cake batter…what do you think. Keep doing the fantastic job you do…so looking forward to your next show. Bendiciones Muneca…gracias! So curious about the texture of this Pastel de Almendras! It turned out beautifully, but it tastes more like a mousse than a cake. I guess I was anticipating something more like the flourless chocolate cake that is served at Tacubaya in Berkeley,California. I would be interested to hear about the experiences of others who have tried the recipe. Love your show, which I discovered ‘por puritita casualidad’ on KQED. I hope Pati’s Mexican Kitchen will become a regular offering in the San Francisco Bay Area. Oh yes, it is a super moist cake! Thank you so much for tuning into my series and letting me into your home Susi.